The game of colf was played in the Netherlandish speaking part of the Low Countries, the present Netherlands and Flanders. The game was mentioned for the first time in 1261 in a poem from the medieval Flemish poet Jacob van Maerlant. 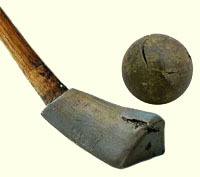 The game was played with curbed wooden clubs and spherical wooden balls in the streets, in the churchyards and on the open fields in or around the towns. In a later stage the wooden clubs were replaced by iron-headed clubs. Not much is known about the rules of the game. It was probably a one target team game. The team that would reach the target, consisting of a tree, a stake or perhaps a hole, in the fewest number of strokes would be the winner. When more and more accidents occurred in the towns, hitting passers-by, breaking glass windows from churches and houses, the game was banned from the towns into the unprepared open fields. During the Little Ice Age in the 16th and 17th centuries colvers enjoyed playing on the ice surface of the canals, ponds, lakes and rivers. Playing on the ice required different equipment, like Scottish cleeks and leather balls. Because of the crowded ice fields the golf game changed from a distance oriented game into a target oriented game. By the end of the 17th century the interest in the colf game reduced significantly and finally ceased to exist. Its place temporarily was taken over by the French game of ‘jeu de mail’ and the indoor game of ‘kolf’, a mix of the ancient colf game and the French mail game. Today the indoor kolf game is still played in one of the provinces of the Netherlands. The hole as a target: a Scottish or a Netherlandish invention?